Over the last decade the two traveled to Taiwan many times to visit her family. Nathan loved trekking along windy mountain roads to visit oolong tea villages, and working on cracking the culinary code for san bei ji. They ordered it in various restaurants in Tianan, a region she described as “the food capital of Taiwan,” where “the home-cooking restaurants downtown are affordable and delicious as opposed to fancy and expensive.” After ten years of trial and error cooking, re-tasting san bei ji in Taiwan, and one final visit to a home-cooking restaurant run by Ling-wen’s mother’s friend, Nathan finally mastered the dish. “It’s all there now,” he said. The dish is made by cooking chicken thighs in a wok with soy sauce, rice wine, sesame oil, Taiwanese fermented chili-bean paste, ginger root (shaved on a mandolin), scallions, and Thai basil leaves. The dish is served family style with short grain rice and a vegetable. The day I was there he made bok choy sautéed in garlic and sesame oil. “It came down to getting and handling the meat right,” He said. You cut chicken thighs with a cleaver so that you have pieces of chicken that are about 1 ½ inch thick that still have skin and bone, which together give the sauce traditional flavor. “Really fresh ginger is also important.” In Maine, he keeps an eye out for new shipments of ginger at Hong Kong Market and Sun Market. And finally, “Three cups is not the proportion.” Ling-wen and he joked that maybe “three-cups chicken” was a red herring, concocted by chefs to keep the recipe a secret. Alas, here in Portland Ling-wen can continue be the artist she dreamed of being and eat her favorite Taiwanese chicken, too. 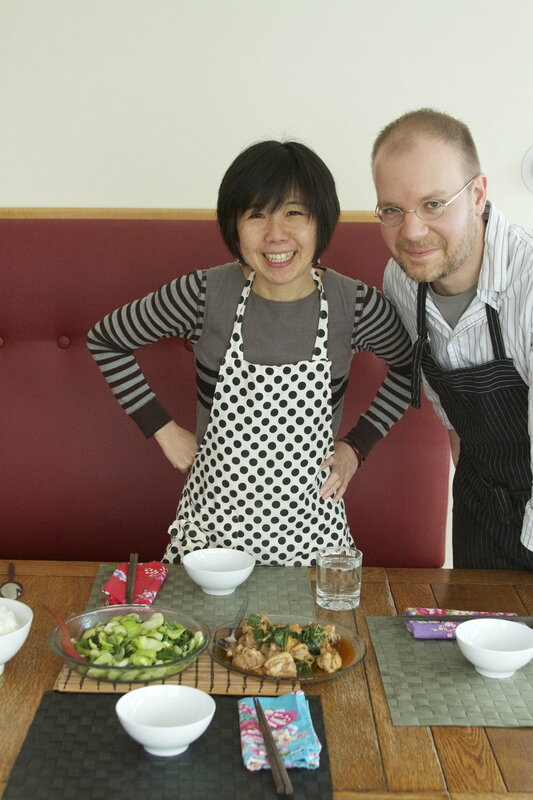 She and Nathan will be cooking san bei ji this Chinese New Year on February 19th. Thanks to Nathan’s extraordinary detective work, you can too.